Heavy duty steel construction, approximately 45 lbs. 14 Gauge Steel. This 3 panel outdoor steel fire pit has a quick and easy assembly process. Can also be used as an insert to keep your in ground fire pit from collapsing. The vent holes allow you to leave the fire ring above ground for proper ventilation, or you can bury the bottom of the ring making a sturdy reusable pit area. Five Metal Design fire rings are a one of a kind accessory for any backyard bonfire. Proudly made in the USA, Five Metal Design provides quality craftsmanship that will be sure to please for years to come. 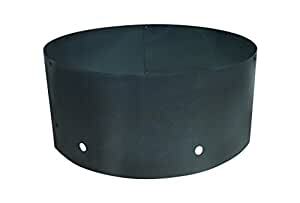 Dress up your campsite or backyard with this heavy duty 14 gauge steel fire ring which can be buried into the ground providing an enjoyable permanent sitting area, or left above ground providing a more secure fire with ventilation holes to keep your fire roaring all night. This solid fire ring can also be used as an insert to keep your in ground fire pit from collapsing. You will have plenty of seating around your warm fire to enjoy stories with family and friends. Weighing approximately 45 lbs, this fire ring is built to last. Five Metal Design fire rings also make the perfect one of a kind Birthday, Mother/Fatherâs Day, Wedding, House Warming, Anniversary or Christmas gift! Family owned and operated since 1999, Five Metal Design knows how to deliver quality! All our products are fabricated in our facility in Neenah, WI. 3 panels that are assembled to create 1 large fire ring.